After the Future had dried on the interior parts as described in part one, the aft bulkhead and cockpit floor/chair were given a wash of 502 Abteilung Oil Starship Filth thinned excessively with odorless mineral spirits. This is my first go with the Abteilung oils and I must say I am very impressed with them. The paint was extremely smooth, especially compared to the Windsor & Newton oils I had been using prior. After the oil paint dried, I removed the excess with a cotton swab and mineral spirits and gave the parts a coat of matte varnish. I added some Vallejo Model Color Flat Red to the headrest and Vallejo Model Air Steel to the circle on the control yoke just for a little color variation. The pilot have five (!) individual decals on him: three on his helmet and one on each shoulder. Those were applied using the Micro-Set and Micro-Sol method and sealed with gloss varnish. The pilot was then given a coat of matte varnish and his helmet and boots were given a coat of gloss varnish applied with a brush to represent the polished armor they wear in the movies. The interior of the cockpit ball was also given a coat of Tamiya Neutral Grey (XF-53). The front bulkhead was primed and given a coat of Neutral Grey followed by wash of Starship Filth. After I painted it, I realized the color call-out in the instructions was German Grey, not Neutral Grey. 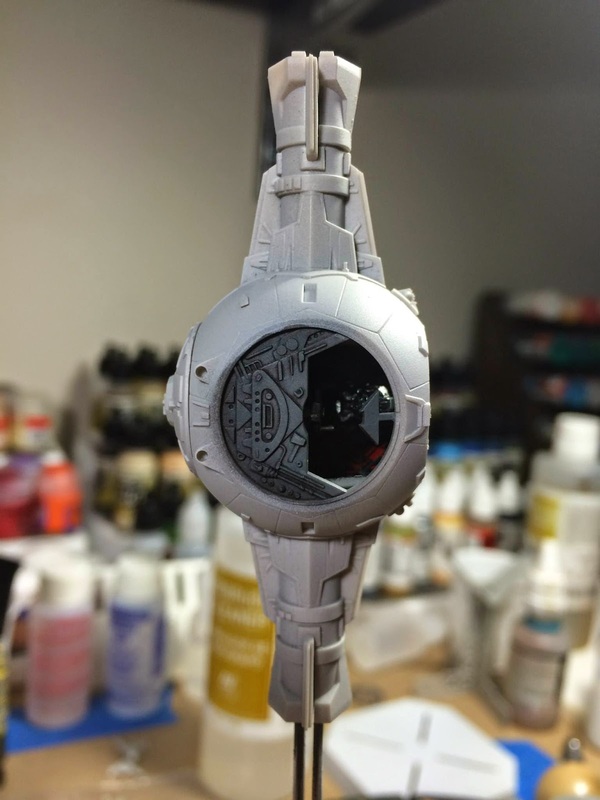 I didn't think it was that big of a deal so I resisted the urge to repaint it. I dipped the cockpit glass in Future and allowed to dry over night. Using the Graphics Encounters vinyl masks to mask the windows (which worked perfectly! ), I primed the frame black and gave it a coat of Neutral Grey. 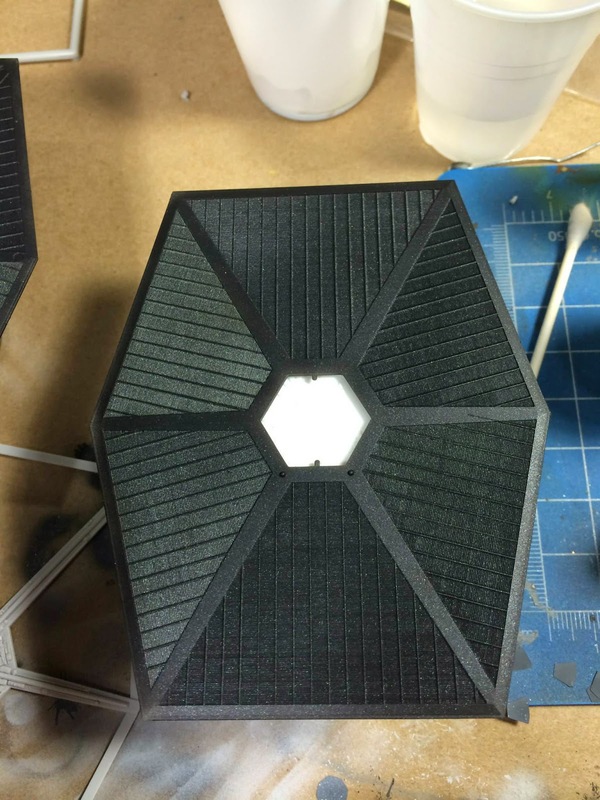 I also masked the escape hatch on top of the cockpit at the same time and primed it grey. 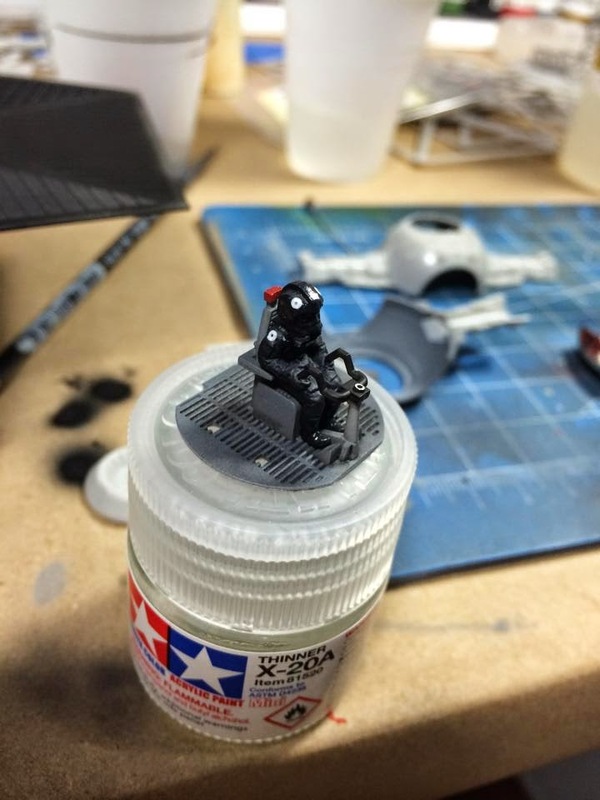 I set the cockpit glass aside and moved on to priming the cockpit ball assembly. Primed and read to go! 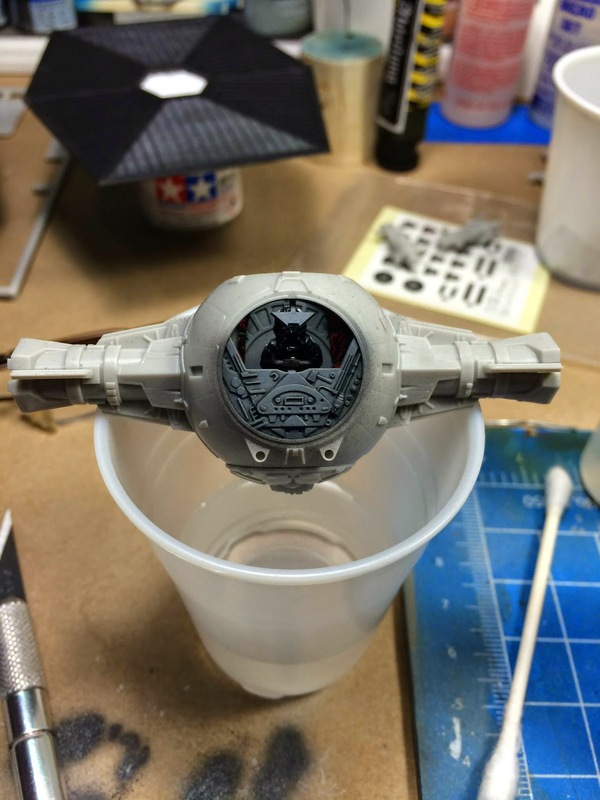 I masked the front bulkhead and the escape hatch with a big blob of Silly Putty and gave everything a coat of grey Vallejo Surface Primer followed by a preshade of VMA Black along all of the panel lines and where I felt shadows would be (this step was not pictured). I should note that I did not attach the laser cannons to the front of the cockpit, which I would later realize after the hull had been painted (I will not make this mistake on the next TIE). I also painted the engine nozzles and the two greebles that attach to the front of the hull near the wing pylons with a coat of Neutral Grey. While everything dried, I moved on to the wing assemblies. Like I mentioned in part one of this build log, I watched a video build log where the modeler had given the wing panels an iridescent color he noticed the studio models have following a rewatching of A New Hope. 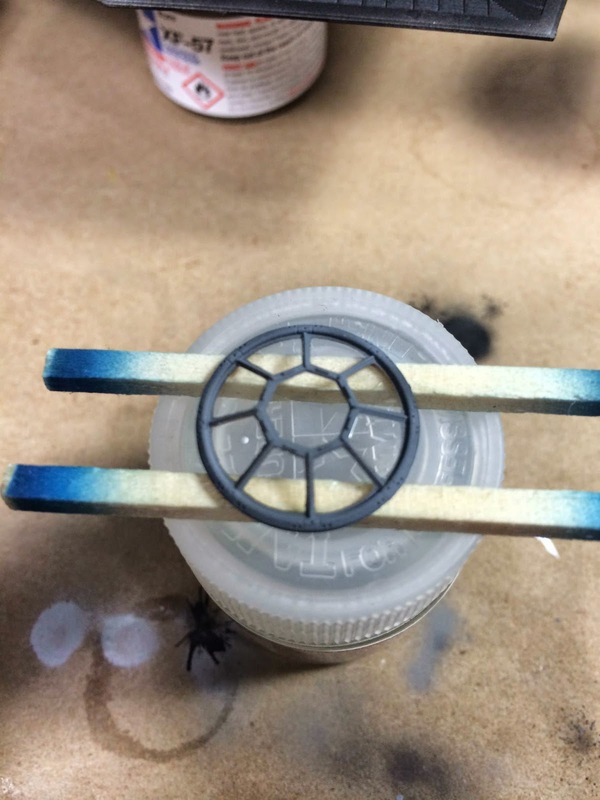 I thought this was a wonderful idea so I made a 5:1 mix of VMA Black and VMA Arctic Blue (metallic) and gave the panels two coats through my Badger SOTAR 20/20 airbrush. This mix was also heavily thinned but flowed through the airbrush beautifully, even with the small needle. I set them aside and began working on the panel frames. Preshading on the wing frames. The wing frames were primed with grey Surface Primer and given a preshade with VMA Black before the main color, Tamiya Sky Grey (XF-19), was sprayed on. They frames were then give two coats of Future in preparation of an oil wash. I again used Starship Filth by Abteilung thinned excessively with odorless mineral spirits for this. Starship Filth is a unique dark black/brown that looks great on models like this. After the oil was dry, I cleaned up the excess with a make-up applicator (they do not leave fuzzies on the model like cotton swabs) and sealed everything with matte varnish. I then painted the edges of the interior panels with Sky Grey and glued them together. No varnish was applied to the interior panels. Painting of the hull was easy enough, as only one color was used: Tamiya Sky Grey (XF-19). Care was taken not to apply the paint to thickly as to allow the preshading to show through. After the paint was dry, I applied a coat of Future in preparation for the decals, which were applied with the standard Mico-Set/Micro-Sol method (here is a good write up on how to do it). After the decals dried they were sealed with another coat of Future. Then I applied a wash of Starship Filth, making sure to get it in all the panel lines and nooks & crannies, and it allowed to dry. When it came time to clean up the excess wash, I used a sweeping motion in the direction of travel to give some slight streaking. 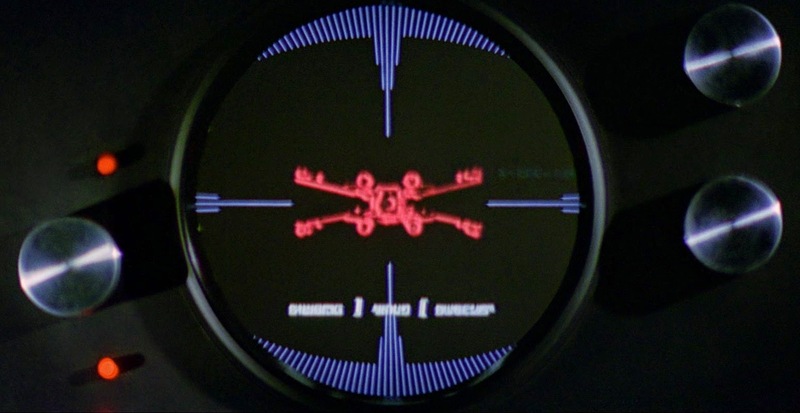 I tried to keep this at a minimum because TIE fighters, being such a fragile craft, are thought of by the Empire as being expendable and therefore wouldn't seen much action before their inevitable destruction. After the wash and streaking were dry, I sealed the model with matte varnish. I then glued on the completed wing assemblies and I used Micro Kristal Klear to attach the escape hatch and cockpit glass to the hull. I then went back using Neutral Grey to paint some of the various greebles on the hull. The cannons were painted with Sky Grey over a black primer and glued in to place. I painted the tips with VMA Chrome and painted a mix of Tamiya Clear Red and Clear Yellow (the instructions call for Clear Orange but I didn't have any) on top of the metallic tips. 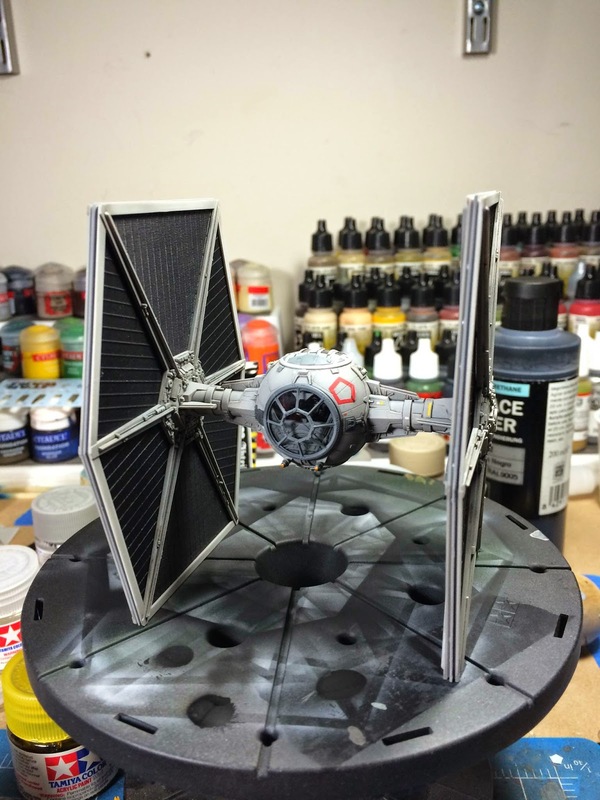 I primed the stand with white Tamiya Fine Surface primer from a spray can. I then gave the base a couple of coats of Tamiya Flat White (XF-2) and covered with gloss varnish. 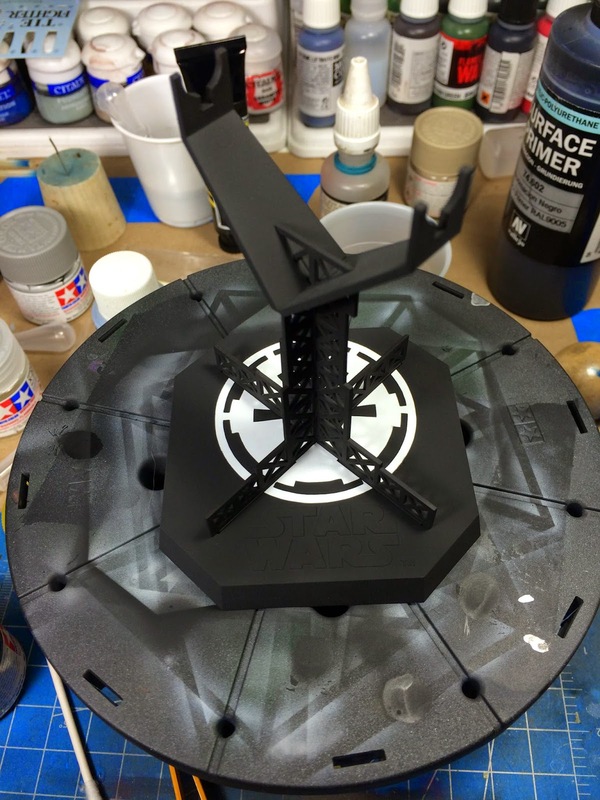 Using my wife's Silhouette Cameo, I cut an Imperial cog out of adhesive vinyl and placed on the base above the "Star Wars" logo. 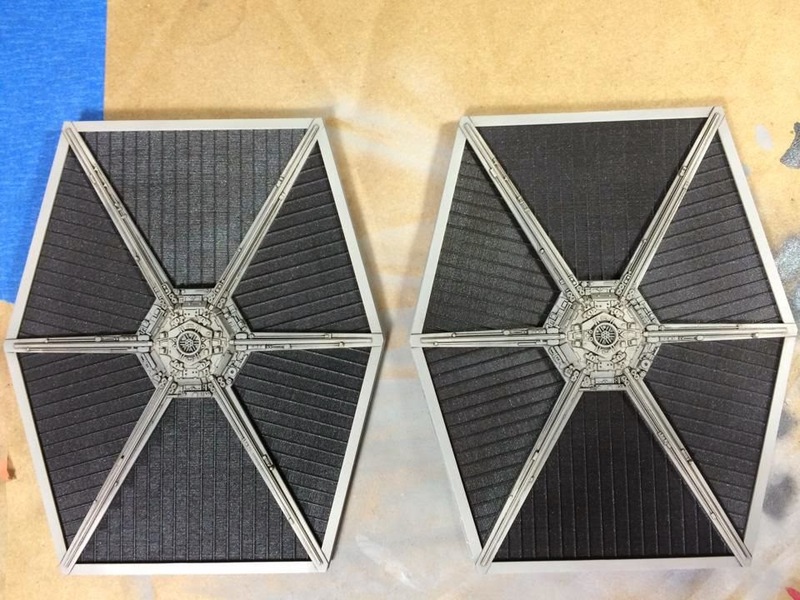 I then painted the entire base and framework using Tamiya Flat Black (XF-2) after which I removed the vinyl mask revealing the glossy imperial cog underneath! 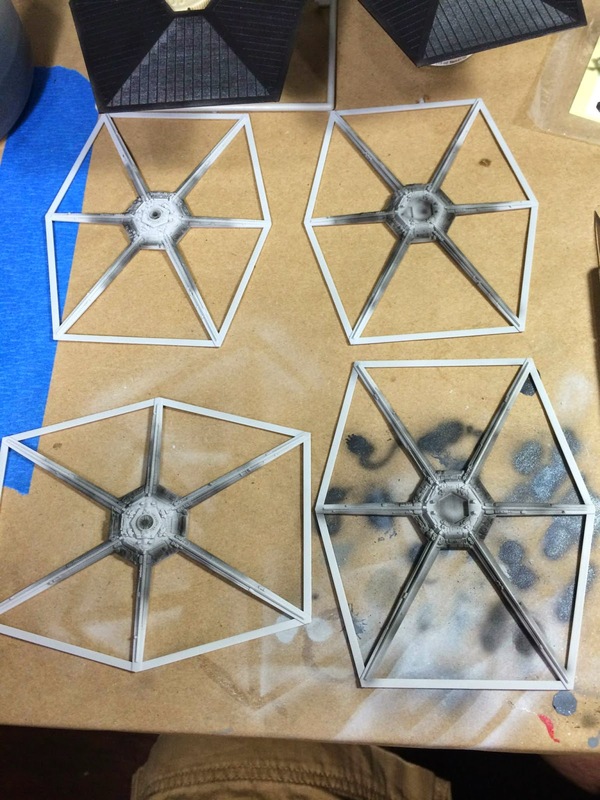 I gave the Star Wars logo a light drybrushing of P3 Pig Iron metallic paint just to make it stand out a little. I was particularly please with how this turned out and I think it is a nice touch. That being said, I think I will sand down the raised Star Wars logo on the next stand and make the Imperial cog larger and more centered. The model was now complete! I had to take this photo with my iPhone because the memory card on my Nikon was corrupted (doh!). It isn't a bad picture, I just know I could do better. When I get a new card I will snap some new pictures from different angles. When it was all said and done, this entire build took no longer than four days. That is extraordinarily quick considering how nice of a model this is and for me especially, considering how slow I build and paint things. Even though I used no new techniques, as my first scale model, I feel like I learned a lot about model building with this under my belt. This model looks absolutely gorgeous in my new display cabinet as well. 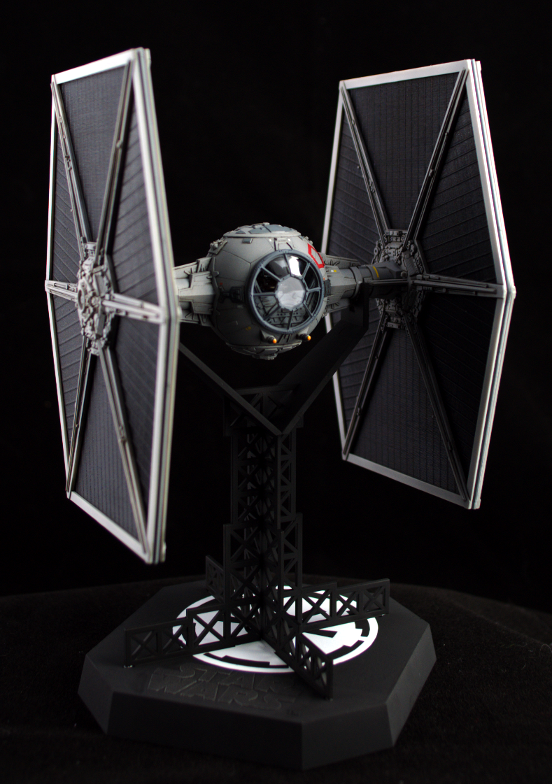 Stay tuned as I turn my attention to Darth Vader's TIE Advance/X1 in the coming days!